When troubleshooting in DSI Workbench, test results may be manually or automatically imported from automated test equipment (ATE) or from the built-in tests (BIT) of the system. This process requires select the data type, data location and test identification matching between the ATE or BIT test results and the eXpress design. Automated Test Markup Language (ATML) – IEEE standard 1636.1-2007. Note: Most of the 1636.1-2013 standard is implemented. For details contact DSI. Parametric Data Log (PDL) – IEEE Standard 1545-1999. DSI proprietary XML Test Result format – This standard is designed to be extremely simple to implement (i.e. requires only a test ID and a pass/fail result for each test) and is fully documented in the Run-Time Authoring Tool help files. Manual entry of fault codes generated by the ATE or BIT. Manual entry from a list of starting points in the diagnostic flow. 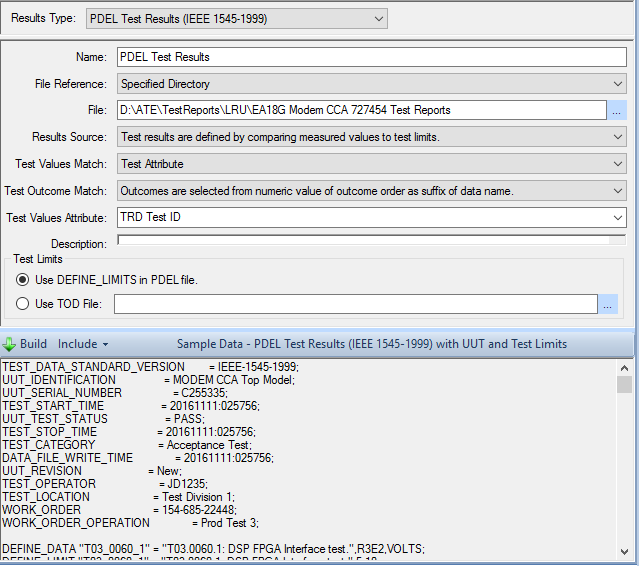 Test results configuration for PDL format showing sample data.